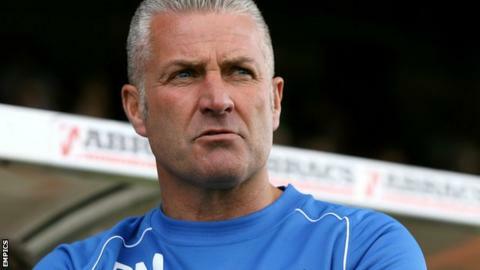 Wrexham manager Gary Mills says he does not have the finances to strengthen his squad during the January transfer window. The Dragons' National League play-off hopes suffered a further blow when they lost 3-1 at home to Woking. Mills admitted Wrexham had problems after a fourth successive defeat, but said he was not in a position to make wholesale changes. "I'm not in a situation where I can bring loads of players in," Mills said. "We haven't got the finances there to do that." With Tuesday's trip to Altrincham postponed, their next league game is at home to Lincoln City on 23 January after a trip to Torquay United in the FA Trophy next Saturday. "In football players lose a little bit of confidence and maybe lose a little bit of belief in themselves because it's not going too well," Mills added. "But they've got to snap out of it, we've got to snap out of it and we've got to put it right. "We're gradually working down that league and that's not what I want to be doing. I want to be going the other way."